The single largest construction project in the history of country's second poorest City is well underway. Phase III of the one billion dollar Joint School Reconstruction Project includes the two year long renovation of City Honors High School. This project brings to a total of 100m dollars in public investment to this emerging arts and education neighborhood. Recently completed projects include - Performing Arts High School, Artspace and the Merriweather Library. Best Street is on the left. Click here for larger image. 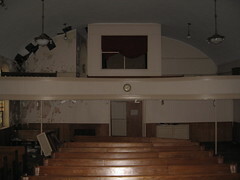 Here's the first in a long series of weekly reconstruction pics. The temporary two year home for City Honors High School students is School #8, pictured below on East Utica and Masten Avenue. School #8 is a short two blocks away from the recently renovated Performing Arts HS and directly across the street from the Queen City Farm project. 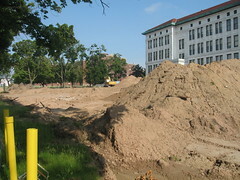 fixBuffalo readers may remember the year long series of pics involving the reconstruction of that school, here's the archive. City Honors is a local landmark and is also on the National Register of Historic Places. Retired City Honors English teacher Chuck LaChiusa has documented the history - right here. Originally known as Fosdick Masten, this city high school also has a well loved local history museum - Hilltop Museum. One of the schools most famous graduates and best known intellectuals from Buffalo's East side, Richard Hofstadter (1916 - 1970), graduated from Fosdick Masten High School in 1933. Harry Emerson Fosdick (1878 -1969) son of Principal Frank Fosdick, went on to become the first minister at Riverside Church in New York. 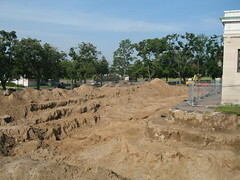 I'll be following construction developments here at City Honors on a weekly basis. 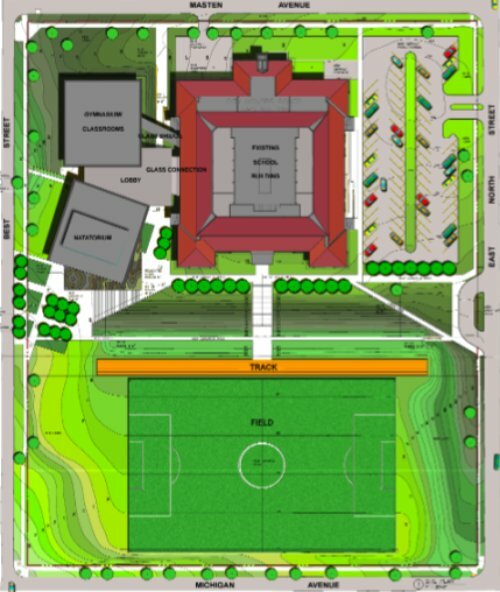 I'll also have some interviews from Board of Education Architect Paul McDonnell and City Honors Principal Bill Kresse about the plans to rehab and add a few major structures to the City Honors campus. The school frames part of this East side neighborhood and is a very short 10 blocks from Performing Arts HS, just down Masten Avenue. 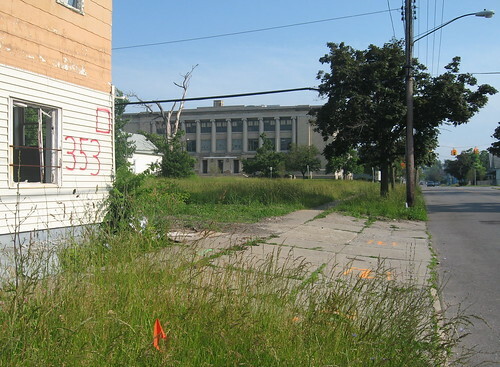 Buffalo's 'urban prairie' is growing at an ever increasingly faster rate. The first time I started thinking about this amazingly complex phenomenon I started reading what Soundlab's Craig Reynolds had to say about this place. THE ARGUMENT: Buffalo provides a challenge, not a legacy; it taunts the uninspired until they flee to a city where legacy’s flow will carry them along, like New York, San Francisco or Seattle. Buffalo requires a substantial commitment, like that of a drowning man to his condition. In Buffalo, we wrestle with God, Job’s God, and the fact of being is enough. I begin to understand this after asking my 2 friends visiting from Seattle how they like the Albright Knox Art Gallery, the first stop in my weekend tour of Buffalo’s monuments to greatness. Pointing at Andy Warhol’s 100 Cans, they ask, “how Buffalo get a Warhol?” making me realize: 1) my friends aren’t exactly Peggy Guggenheims, but that’s perfectly a–okay; and 2) even after enjoying firsthand some of the greatest paintings anywhere, the misconception that Buffalo couldn’t possibly be significant remains even still. Read the rest from Craig's 1997 essay How Buffalo Get a Warhol? 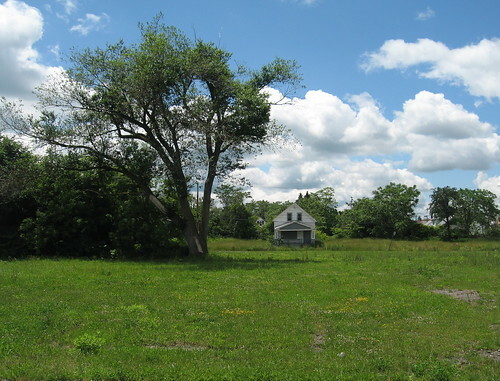 I've assembled some of my favorite pics of Buffalo's 'urban prairie' - right here. Undeliverable and Unbelievable - Unstoppable? The latest data and maps from the HUD and US Postal Service mash-up arrived this afternoon from Anthony Armstrong over at LISC - Buffalo. He's been analyzing and synthesizing HUD and Postal Service data about "undeliverable addresses" - aka "vacant houses" - here in Buffalo for the past year. fixBuffalo readers may remember - Undeliverable, No one home... - from May 2007 and - Undeliverable or Unbelievable? - from October 2007. Today, fourth quarter data for 2007 hit my desk. Today's numbers? No surprise. The trend here in Buffalo, NY? Things are getting a whole lot worse and neighborhoods that were once vibrant are hollowing out at an alarming rate. Click on the either map. The first one shows Buffalo at a glance today and the the second map shows the disturbing trend - change over time - for the past two years. Both maps clearly show that Broadway/Fillmore and large sections of Masten are being swallowed up by the ever increasingly larger 'urban prairie'. Black Rock and Riverside are sliding, too. A fixBuffalo friend and I spent some time on Bailey Avenue recently observing the rapidly deteriorating urban landscape. There's a strong positive correlation here between our observations and the recent HUD/Postal Service data. It's simply staggering as people struggle to maintain their lives and dignity in neighborhoods that are hollowing out and where even a semblance of commercial and retail activity is slipping away. If you still haven't seen LISC's Buffalo Tour - 2007, you should. Buffalo Rising's own Elena Buscarino interviews Michael Clarke and Anthony Armstrong in a short video that you won't want to miss. On Friday I met with City officials and explained the plight of the First German Baptist Church (1870) over on Spruce Street - see Death or Resurrection. I sat down with Council President David Franzcyk, Commissioner Rich Tobe and Michele Brozak, the secretary of the City's Preservation Board. 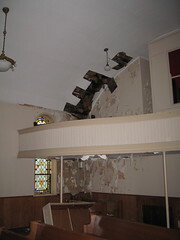 After discussing the situation with Rich Tobe and sharing with him that the stained glass, heating system and pews were still intact, we walked down the hall and he directed City inspectors - Mike Schieber and Tracy Krug to send out the City's board-up crew. Later, Michele Brozak assured me that she'd keep a watchful eye on this piece of the City's unique cultural heritage as the owners - Trinity Baptist Church 2926 Bailey Avenue - prepare to demolish the church. I placed numerous calls to Pastor Jemmison on Friday and stopped over to see him. Still no word. 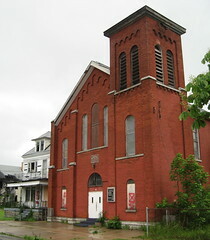 Meanwhile if any fixBuffalo readers have additional historical pics of this church, kindly let me know. I'd like to share them here. 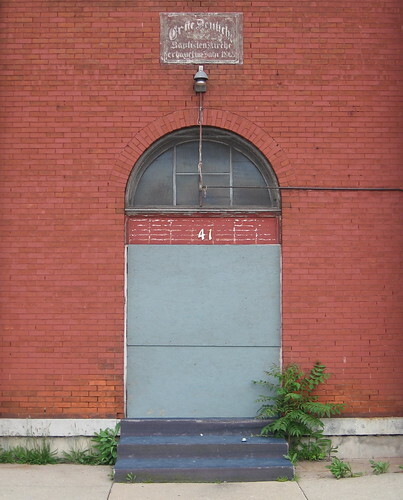 Yesterday, a fixBuffalo friend and I headed over to Spruce Street and noticed that Rich Tobe and third floor folks at City Hall had sealed the doors. I'll be keeping a close eye on this amazing little church. 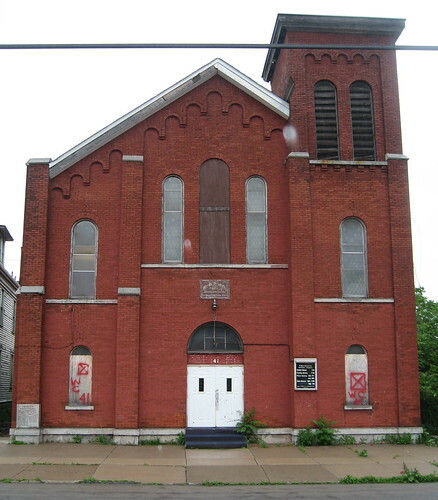 While scouting the City today for locations with an indy film company, we took an opportunity to check out the First German Baptist Church (1870) at 41 Spruce Street, just east of Michigan Avenue (google map). 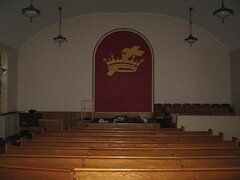 I first posted about the church three months ago - Choir Lofts? - as I've become increasingly more interested in the reuse of these amazing buildings. This afternoon, much to my shock, disgust and total loss of faith with this City's possible resurrection and how the progressive hollowing out is continuing to resemble the singular dimensionality of the suburbs, I noticed that this church had just been visited by the "red mark of death" - yes, off to the landfill for this one. I pulled the door handle and much to my surprise the door opened. 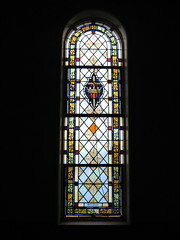 We went in...and found a church structure that is amazingly intact - save one hole in the roof - with eight 12' x 2' stained glass windows, pews and a choir loft that would make an ideal sleeping space and bells that still ring! I'll be tracking this one for sure. If you're interested in making this place your home, I'll help you negotiate the maze at City Hall, point you in the direction of good legal and rehab financing. While the kitchen is laid out like any other church kitchen you might know, with all the appliances still in place, the rest of building appears to be in excellent structural condition. No falling bricks or collapsing walls! The parsonage appears to be in excellent condition as well - save it's own pending fate! While the Livery on Jersey Street gets the spot light, over here on the City's East side the remnants of a once coherent and vibrant city are prepared for demolition without so much as a bang, or a whimper. They simply slip away 'till one day they're gone. So...if you're interested in making this place your home, please let me know. I'm fascinated how other people see and understand Buffalo - the second poorest city in the country. 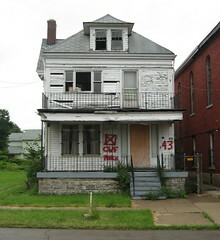 Late last Summer New York Times reporter Ken Belson came to town and shared that Buffalo, NY has the second highest rate of vacancy in the country - see, Vacant Houses: Scourge of a Beaten Down Buffalo. French rock star intellectual Bernard-Henri Lévy was here and wrote this about Buffalo, NY two years ago. Today I found this video, courtesy of Al Jazeera, that was just released. The sinking US economy is perhaps the most important issue in the presidential race. On this week's inside USA, we travel to the city of Buffalo, New York to see how the city is weathering the economic storm. While tax breaks on waterfront condo development, the lure of casino development and $194,000 residential real estate on Chenango Street seem to prevail, entire sections of the city continue to fall off the radar. Link to Al Jazeera story - Recession Blues for Buffalo City.